I’m not really into puzzles. I mean, I don’t think I am. It doesn’t occur to me to conquer a jigsaw puzzle. It’s tough for me to commit to any game, really, although I enjoy backgammon occasionally. A game or a puzzle feels like such a commitment. Sometimes, though, once I’m in, I’m in. Sometimes I even get obsessed. I don’t know if the obsessed part is a good thing or a bad thing or just a thing. A couple of Christmases ago, Dan’l (of occasional amusing writing fame and with whom we’re doing this Big Year) gave me a Jackson Pollack jigsaw puzzle as a joke. There was no way I was ever going to attempt such a thing, but I did laugh with him about it. I tried to sell it at our yard sale, but there were no takers. My neighbor Dorothy, however, made the mistake of picking it up, looking at it, and mentioning that she liked jigsaw puzzles. Her birthday was about a month later. Under cover of darkness, I left it on her porch with a birthday message. Anonymously. When Christmas was rolling around again last year, Dan’l sent me an e-mail asking if I still had the puzzle, as he had some other plan for it, which I never did discover. I let him know I had indeed regifted it, and during that conversation, he learned in no uncertain terms that I am really not a puzzle person. Keep the puzzle and put it together sometime. Keep the puzzle and give it to someone who might like it. Could be done after #1. Leave the puzzle with me with the understanding that no puzzle will ever be received in the future. 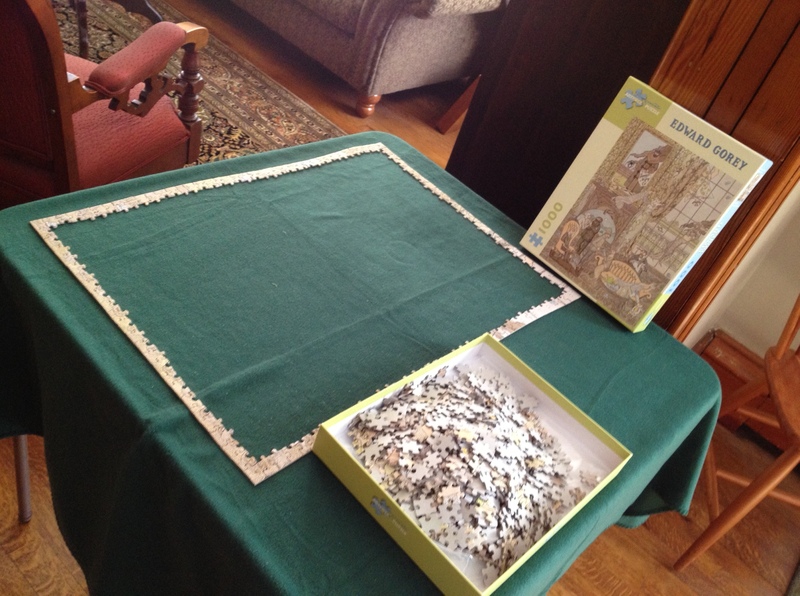 Leave the puzzle with me, and I will put it together and then frame it for you as an art object for your place. Scream at the insanity of anyone thinking you would like something like this. No hurry in giving an answer. That note alone made me want to do the puzzle. Or get to the point at which I had done the puzzle. I told Dan’l about it, sent him the photo even, and he asked that if she kept it together that he be allowed to see it in person when he next comes to visit. But back to my puzzle. The puzzle is being assembled on the card table, but I soon discovered that at least half my dining room table had to be used as staging area. This worked until I hosted a dinner party on February 25. In preparation for guests, I carefully put like pieces into Zip-lock bags so I wouldn’t have to sort them again later. And then there was a long pause in puzzling. I went to Portland for my birthday. I went to Maryland for a memorial service and to visit a friend and relatives. In between those two things, I started working on the puzzle again. A couple of people have seen the puzzle, people who do these sorts of things. I have heard more than once that this is a hard puzzle, which makes me feel a bit better about my lack of speed. Last weekend I worked on it a lot. The thing is, when I’m working on it a lot, it means I’m avoiding doing other things. Maybe that’s one of the reasons I don’t do puzzles. There are so many other things I should be doing. 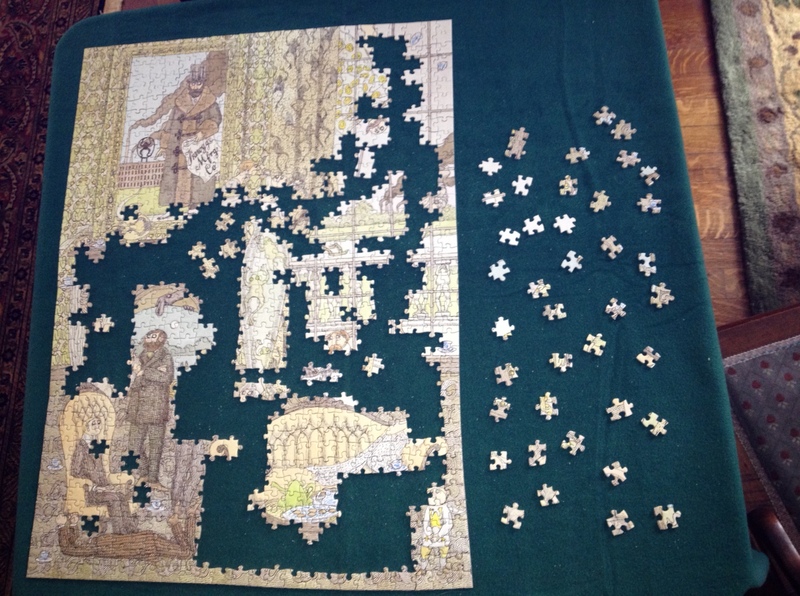 The puzzle, though interesting, gives me one more way to procrastinate. I already have lots of ways. It’s getting harder. I’m down to all these pieces that look exactly alike. I sit down and try to face them, and I can feel the panic setting in. I don’t know where to start. It feels a lot like the tasking I am faced with every day: Everything needs to get done! Everything is equally important! Where do I start? How can I? This is impossible! Maybe that is another reason I don’t do puzzles. I am not fond of feeling this way. But eventually, in both cases, pieces fall into place, although usually not as quickly as or in the order in which I’d like them to. Yesterday there was a knock on my door. It wasn’t a shave-and-a-haircut knock, so I knew it wasn’t Laura. I’m often hesitant to see who it is, because many unannounced knockers want to sell me something or tell me about Jesus. 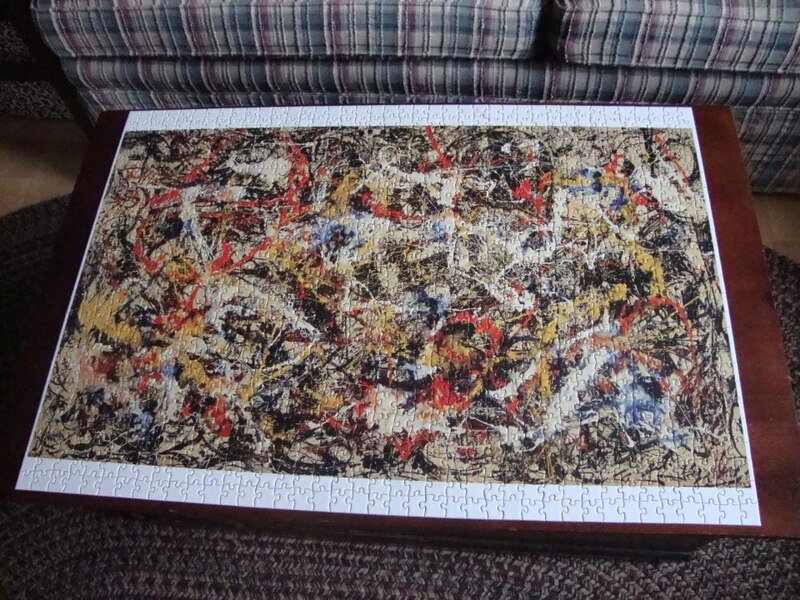 But I bravely ventured downstairs to the door, and there was Dorothy, the Jackson Pollack puzzle in her hands, now jigsaw glued together into permanence for my own enjoyment or for Dan’l’s. It’s really wonderful. My immediate inclination was to give the Pollack to Dan’l. I have no room for more art. From this chair in my office I can turn and see four pieces I received for my birthday a year ago that still have not found their way onto limited wall space. And maybe I will give it to Dan’l. But Dorothy’s Pollack is really impressive. I don’t know if we can let it go. Tim kinda loves it. It’s storied. Like the pieces it’s made of, we may have to look carefully to discover where it fits. Tim and I sat down to compare lists yesterday, which is always a good idea, because we both forget to list birds, then our memories are jarred by an event (We saw that at DAR State Park, remember?) or the realization that we are sometimes so used to seeing something that we forget to write it down (bluebirds! vultures!). So to my January list I hereby add the lesser scaup and the eastern bluebird, which brings my January total to 39. February was pathetic. I added one species—house sparrow—seen at my feeder, bringing my total to 40, which is still a dozen species more than the same time the year before, thanks to January. March is looking up. Stay tuned, beak geeks. S/he looks sad. Maybe a kiss will cheer her/him up. S/he’s not expecting it! What will s/he do? Let’s find out! You considered it in high school. Just do it already. Grandfather clause—there is a kissing history. If you had a reason, it wouldn’t be spontaneous. The grocery bill adds up when you want the good stuff—or, at least, the better stuff. The wild-caught salmon looks particular yummy. We need decent salad greens, even though they are boxed and shipped to us from California. Hitting the cheese case is always a danger (ka-ching!). The meal I am taking to my neighbor after her surgery calls not for parmesan, but parmigiano. I will not skimp. Nor will I pass by the manchego or the fresh goat cheese. My neighbor’s mother will be taking care of her (and the grandchildren) for the next few weeks. She might appreciate the bottle of chardonnay I add to the cart. She might, in fact, need the bottle of chardonnay I add to the cart. Is a day without grapefruit a day without sunshine? It’s been gray since I’ve last blogged, weatherwise and emotionally, with some family worries and news of four deaths in five days—a person who meant something to me and several who meant something to people who mean something to me, all of whom I had once met. I seem unable to accomplish everything that needs to be done. I stumble about in the world and in cyberspace. I waste time. But this morning I blog first, I dream of that first sip of grapefruit juice, and I send love to my neighbor who is having surgery right now.